Indian diet is majorly based on crops and cereals and in every cuisine, wheat, rice, pulses etc are compulsory and are liked. They are even filled with lots of nutrients and has their respective health benefits too. Pulses are one of the well-known crop item of Indian cuisine. There are many types of pulses. Today we will be talking about different types of pulses and their health benefits. Pulses may be defined as the dried edible seeds of cultivated legume. They belong to the family of peas, beans and lentils. The pulses are a large family and various species are capable or surviving in very different climates and soils. Traces of pulse crops have been found from ancient times in archaeological sites of both the Old and New worlds and they appear to have been among the earliest domesticated plants. Pulses are cultivated in all parts of the world, and they occupy an important place in human diet. Pulses contain more protein than any other plant. They serve as a lost-cost protein to meet the needs of the large section of the people. Nutritionally, immature fruits have distinctively different properties to those of the mature seeds; the protein content is lower but they are relatively richer in vitamins and soluble carbohydrates. Pulses are fairly good sources of thiamine and niacin and also provide calcium and iron. Pulses are rich in nutrients. The following chart will be showing the amount of nutritive elements present in the calculation of every 100 gm of pulses. Now, we shall be discussing about the benefits of pulses. On the above section we discussed about the nutritional elements of pulses. In the present section we will be talking, how pulses are beneficial to rescue health through its nutritive elements. All the pulses are used in a variety of ways. 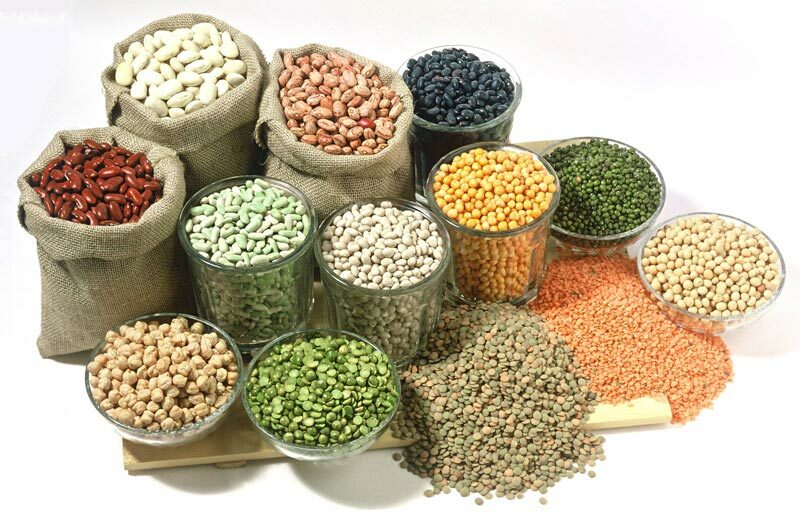 Pulses are used as a common foodstuff in forms as pulses, de husked, decorticated and whole seed. These are used as a stuff material in chapatis etc. Pulses are also used in the form of flour such as that of Bengal gram, green gram, black gram which are often called ‘besan’. Now, we shall be shortly talking bout the different types of pulses. Bengal gram is also called ‘lal chana’ whose roasted flour is called ‘besan’. It is one of the richest source of protein and is often used in salad dressing and an important part of diet. It is frequently used in Indian cooking as a thickener. It has a meaty rich flavor. Often stewed with vegetables like bitter gourd and squashes. Chana Dal with spinach and louki with chana dal are very popular dishes. In the Indian vegetarian culinary scenario, Bengal gram is a major ingredient. It is essentially used in making curries. In the southern India, unripe grams are picked and consumed as snack and the leaves are added in the making of salads. It is believed to have originated in western Asia. Black gram is one of the most highly prized pulses of India. It’s Indian name is ‘Urad‘. It is produced in pods which are narrow, cylindrical and up-to 6 cm long and the outer skin is grayish black and the inner is creamy white and oval in shape. They are extensively used in India in various culinary preparations such as dosa, vada, papad and could be eaten raw when sprouted. Black urad dal when sprouted is very refreshing, healthy and nutritious and it can be used in several forms. Sprouts are fantastic addition to salads or you can make delicious chaat for snack. Growing sprouts is fun and they can be grown anytime anywhere. There are no complicated step to sprout these beans all you need a bowl, water and towel. Green gram is also called ‘green moong‘ in Hindi terms. It is recognized as one of the healthiest gram and pulses of all. It is free from the heaviness and tendency to flatulence, which is associated with other pulses.People in the U.S. primarily eat green gram as a sprout, and as a bean it cooks up fast and has a sweet flavor. With its high fiber and nutrient content, it offers a number of health benefits. This very plant is native to India since from the ancient times. The pigeon pea is one of the important pulses in India. It is a woody, short-lived perennial shrub plant. It grows up to 1-4 metres tall and it is also grown as an annual herb. Its seeds are pinkish in colour and are also called ‘Masoor’ in Hindi. Seeds vary in size, shape and colour and these are generally round as well as oval in shape. Pigeon pea is probably a native to tropical Africa, where it is sometimes found wild or naturalized. Its area of cultivation include India, Malaysia, Indonesia, Philippens, The Caribbean, East and West Africa. Bengal gram is very useful to treat diabetes. Experiments have shown that the intake of this pulse enhances the utilization of glucose. Bengal gram is a valuable astringent for use in dyspepsia, vomiting, indigestion etc related disorders. All the pulses are very rich in Iron thus are very good to cure anaemia. Cooked germinated gram is a wholesome food for children and individual and One must include these in their daily diet. During menstruation, pulses are very good. It provides you energy and abides the pain. The green gram is one of the most healthiest stuff. It is the rich source of chlorophyll, thus enhances your immune system and body as well. Pigeon pea which is also called ‘masoor dal’ is rich in Vitamin a, thus a very good thing for health purposes. Bengal gram is very beneficial for skin and hair diseases. It cures allergic skin diseases like eczema, scabies, itching etc. Black gram is valuable in digestive system disorders. It should be given in form of decoction. A fine paste of pigeon pea shall be applied on the bald patches. It cures baldness. The leaves of pigeon pea is the excellent remedy for Jaundice. Pulses are always a types of beauty-aid. It can be used a face pack or mask too. Water in which green grams are soaked is an excellent remedy for cholera, chicken-pox, typhoid, measles and many more. So, in this way we saw different types of Pulses and its health benefits because these are one of the best and the liked food crop all across the globe. Eat well and Live well! It was ok…….gud enough. ……….? Thanks you a lot for such information…..
Its really good and helpful………. Thank you for the feedback. Pulses are the rich source of protein thus should be included in daily diet.